Waste incinerators mod. ECO TECH are discontinuous types of ovens with a static chamber. They have been designed for thermo destruction of waste material having medium-high lower calorific value (L.C.V.). cemeteries, shopping centers, airports and gum, paper, wood, agricultural industry etc. The energy recovery system from gas combustion, fixed over each Eco tech oven, allows low running costs thanks to the improvement of combustion process and therefore the reduction of fuel consumption in comparison with standard ovens. If requested an additional system of energy recovery, for production of hot water with zero-costs, can be added to the oven. 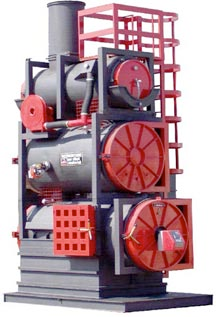 The Scrubber type plant for humid treatment is connected with post combustion process of gas coming up from incineration chamber. Therefore our Eco Tech ovens emissions respond to the most restrictive and severe antipollution regulations. Eco tech incinerators have a destroying power varying from 40kg/h to 300kg/h.